Throwback to 2016 when I was walking the West Highland Way with three friends. I met a woman walking it on her own wearing a buff with ‘Ironman’ on it. I asked her what an ‘Ironman’ was, and felt inspired by her story. Although I have very little recollection of this conversation, my friend Nadine tells me my ears pricked up, and she knew that this was the start of a new adventure for me. 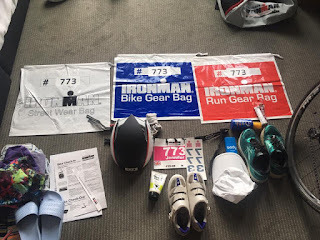 Skip to January 2017 and I decided I wanted to do an Ironman. I’m not one to go halfheartedly into an activity! My boyfriend, Phil, thought it was a huge undertaking and suggested I maybe try a middle distance first, and see how I get on (very sensible!). 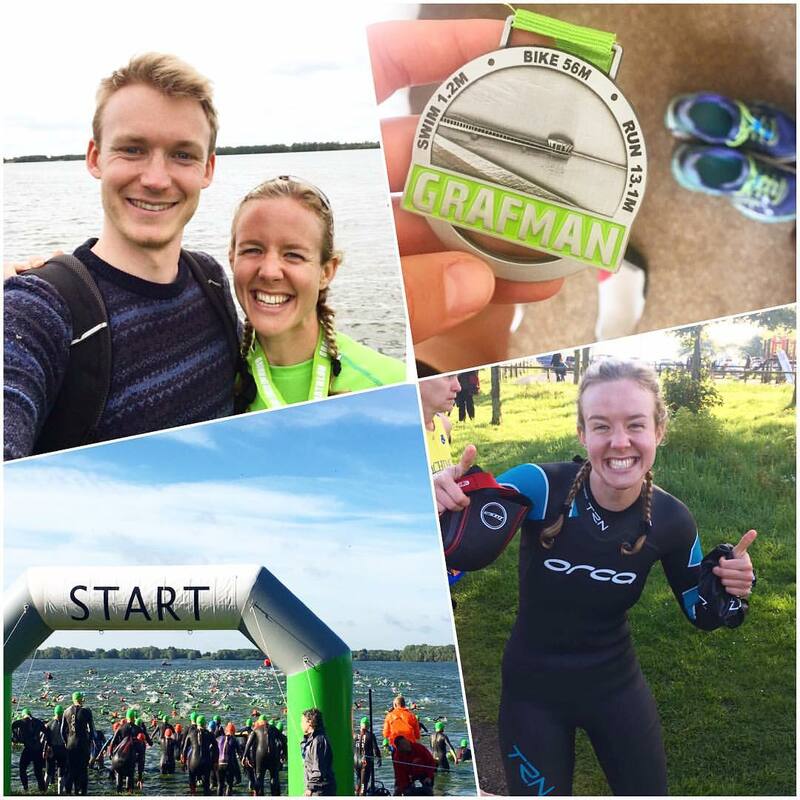 Fast forward to June 2017, I had 2 seasons of triathlons under my belt: 4 sprints (Borders series), 1 standard (Gullane) and built up to 1 middle distance (Grafman- time 5h30 with a shortened swim). I followed Don Fink’s full Ironman plan for this and read both of Chrissie Wellingtons books back to back, taking it all in. By then I felt confident I could cope with the high levels of training and decided 2018 would be my year for the full. I knew a sea swim wasn’t for me after the huge waves I experienced at Gullane so I narrowed my search down to lake swims. I then thought about timing; as a teacher I have six weeks summer holidays. I wanted a race that was near the beginning of the holidays so I had time to relax and recover after it. 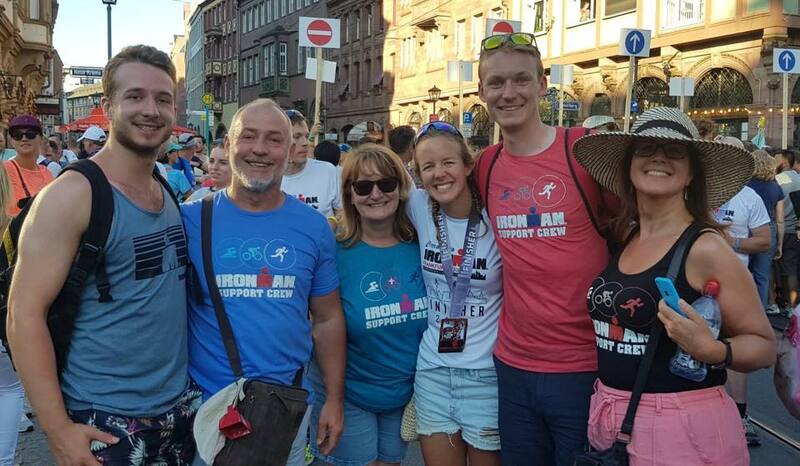 Ironman Frankfurt, 8th July 2018 seemed to tick all of those boxes. Step 1: Telling my family and friends and getting their support was important to me, so that’s the first thing I did. Because I had already tested the water with a middle distance I had full support from them all, and had to regularly repeat the distances, even if only to receive looks of absolute shock. 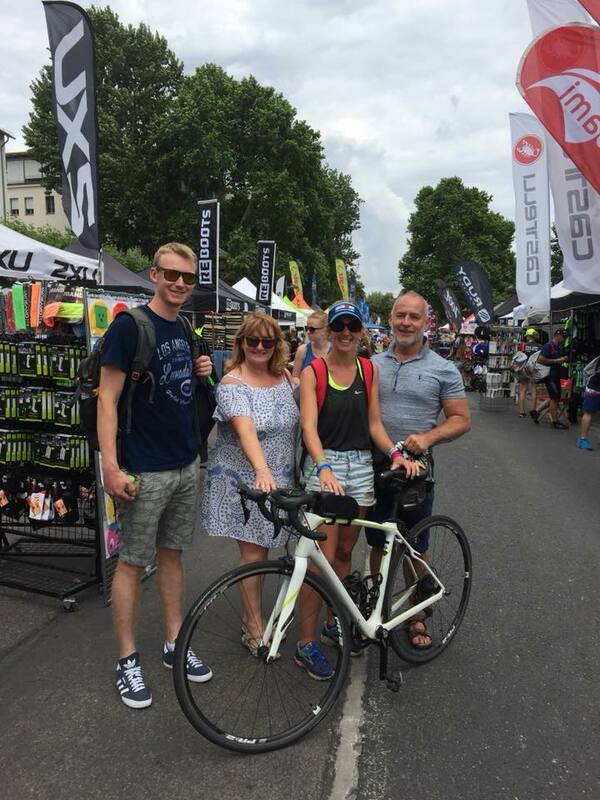 3.8km swim, 180km cycle, 42km run- say whaaaat?!! In one day? You’re CRAZY. Step 2: Getting coached by Karl was something I knew I wanted to do. We had a trial run when he took me through Dublin Marathon training to get a PB (3h38), and I knew that self doubt and my eagerness to say yes to every activity could lead me to over training and panicking. So I committed to following his plan, starting January 1st 2018. I promised myself I would always try to enjoy the training journey, just incase anything didn’t work out on race day- it is too much time and money to invest to have any regrets. So I set off on my training with nothing but enthusiasm and I have to say I loved almost all of it. I loved the structured swim sessions Karl gave me, it meant I always had a focus and could feel definite improvements. I also loved joining my local cycle group, Fietsclub, meeting some incredibly strong cyclists seeing my improvements as I struggled to keep up with them in January. By the time we did the 100 mile sportive in June, I was able to hold a steady pace for a long time, chasing those yellow cycle jerseys ahead of me. I actually found finding pals to keep me company on the longer cycles my biggest challenge. It’s hard not to get bored/ lonely after 4 hours! Met some lovely folk from Ronde and Edinburgh Triathletes– so thank you to them, as well as my own club Pentland Triathletes, for keeping me motivated. Especially Frank who gave up plenty of his own time to help me learn the basics: using a turbo (useful with all the snow this year! ), changing a tyre, buying new tyres, and making sure I had everything I could possibly need if I had a mechanical on race day. Thank you Frank! Cycling no matter the weather- beautiful but FREEZING! The Build up to Race Day. Meeting up with Karl before the race with my giant list of questions really helped settle my nerves. And he was great at quashing self doubt too, which is wasted energy so thank you for that too. I felt well prepared when it came to race day. The build up was INSANE. We arrived in Frankfurt on Wednesday evening and I loved buying the branded gear at the expo and wore it with pride on the race build up, feeling part of a secret group ? Having my family out there to support also helped keep me calm and distracted pre-race. We managed a trip to the theatre and a boat ride along the river in the build up! Thank you Mum, Dad, Matthew, Debi and Phil- you were all amazing and made the whole experience so memorable. Race day started with a 3am alarm. Hair was braided and tattoos on the night before. I actually managed to sleep ok until about 2.30, I have all the yoga and meditation to thank for that. After a breakfast of porridge and coffee (my lovely self catered apartment Adina was ideal for this), we got the first shuttle bus at 4am to Lake Waldersee. I found the swim absolutely magical. The sun rising, the intense build up of what was about to happen. A huge sea of blue hats, interspersed with a few pink ones (only 10% of Triathletes were women). When I looked around and tried to take in the enormity of it all I got choked up, so I tried to just look out at those gorgeous turquoise waters, and breathe deeply. My game plan was to go into a pen a little faster than I predicted, so I stood in 1-1h10 pen. I took off to the far right straight away to avoid the crowds and decided I would rather not be hit on the head by other swimmers, and would rather swim further if needs be to stay in the calmer waters at the edges. This worked perfectly and I felt like I was swimming alone the whole time. When looking at my route on Strava later, I actually didn’t swim further and managed a steady 1h10 which I’m delighted with and felt very comfortable. Quickly out of the water and into T1, I put on my helmet and shoes and grabbed my bike. Off I went! One poor soul had a puncture within the first 100 metres out of transition, and the race marshals were hot on people’s toes for drafting. I decided pretty early on that I did not want a puncture, or a yellow or red card. So I took care to slow down on bumpy roads and let people over take when they wanted to. I smiled at each race marshal as well as each spectator, and said thank you to as many as I could. Smiling kept me in the zone, and reminded me – I GET to do this! One of two bike loops done (~100km), and I was in a rhythm. Eat, drink, cycle. Overtaken by all the speedy bikes on the flat (I was what felt like the ONLY person on a road bike), but i really enjoyed overtaking all of those speedy blokes on the uphill! (This got lots of cheers and woops from the crowds). From kilometre 130 onwards, things started to get a little tougher. I was starting to tire, and I got really numb toes which were getting more and more painful. The flat sections had a headwind, so I felt like there was no break. However I got another lease of energy at around 160km, as I knew it wasn’t long left and the thought of seeing my family spurred me on. Into T2. 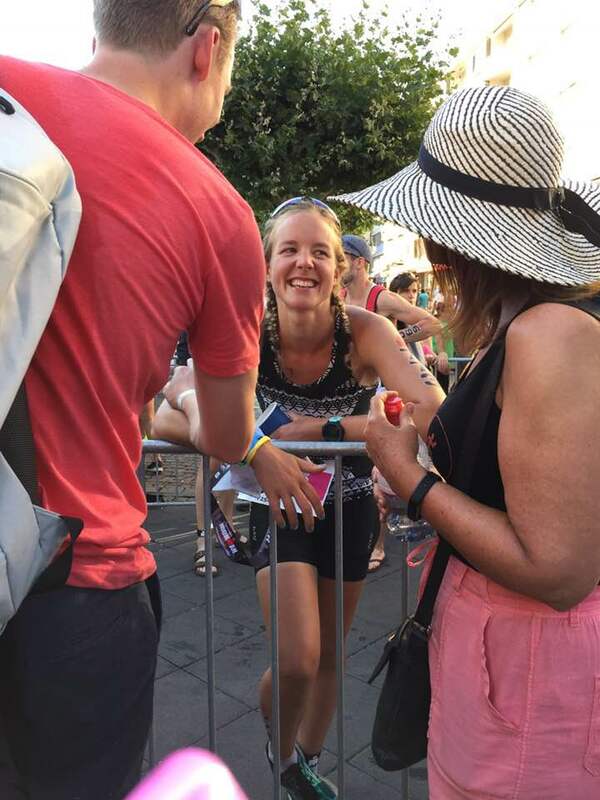 I spotted my whole grinning family straight away – I felt like a celeb with all of the paparazzi capturing the really exciting moment when I changed my shoes and massaged my toes ?. Starting the run was an actual dream after being on the bike for so long, I love to run and was happy to feel the blood in my toes again. Karl recommended I try to run slower than 5.30min/km, so I kept check on my pace and stuck to that. I walked through every aid station and took on water, soaked my cap, and put an ice sponge down my top. All things that felt unnecessary at the beginning, but really paid off as the time went on. Really unfortunately, my belly was not 100% so I needed to stop and use the portaloo (gross!) 3 times on the run, but I took it in my stride, took it as a little rest break, and tried to stick to my pace when back in the game. Just past kilometre 32 was a mental challenge for me, as I was relieved I only had 10km to go, but my quads were really starting to tighten, and the 10km wasn’t coming round quick enough. I slowed at this point, and the splits for the second half were slower than the first. That last lap was the first time in the race when I struggled to smile each time I passed my family, but I just knew as long as I kept jogging, then walking through the aid stations, the finish line would soon be in sight. This was a great race for pacing; 4 loops and a flat course meant mentally I could break it down and I can safely say that I didn’t hit a ‘wall’ or ever consider stopping to walk aside from the water stations. The volunteers were all amazing, offering all sorts to eat and drink and were constantly shouting my name (it was on my bib). My quads reminding me that I have an incredible powerful body that enabled me to do this event. Looking back that final stretch is a complete blur. Did I actually do that?! The photos capture my emotion in the last few seconds. Once over, I was so keen to hold my (giant!) medal and hug my support crew. My absolute world- What a team! Who knows. I think that this is only the beginning. I would like to do a few more middle distance triathlons and try to increase my speed, maybe invest in a more aero Tri bike, and see what I can achieve. Another Ironman? Probably. Not next year though. I need some time to just celebrate what my body has achieved and work on race skill, confidence and speed. I think I could go sub 12h with a bit of practice and a few more brick sessions so will see ? Thank you body. Thank you mind. Thank you family. Thank you friends.